What is the most important factor in realizing technology change today? Is it having the right technology or tools? Perhaps leadership support, as that is cited by so many (including myself) as a top success factor. Maybe it’s the right strategy, or roadmap? However, when it comes to what actually matters most, I have found that it’s really none of these things, though they’re all important along the way, but not absolutely vital to success. Instead, the single most important element in driving successful digital transformation, or whatever you call your large-scale or enterprise-wide technology change efforts, is the ability to execute. You can survive bad or lacking leadership, poor or no strategy, even mediocre technology, if you can actually get something done. And that requires a unique talent, though fortunately one that almost anyone can cultivate with effort. And when I mean get something done, I don’t necessarily meaning doing it personally (though sometimes it is that too.) Instead, it’s the ability to wield the environment around you to accomplish something. Why this is so vital is something that we’ve learned the hard way over the decades from approaches like agile methods: Most of what we initially think we need to do in a technology project or change program is wrong. We can only find ground truth by acting and then seeing how it worked out. We then learn, adapt, and then try again. This makes action, or agency (see definition #2 in Merriam-Webster), the ultimate discriminator when it comes to getting things done. Without action, especially in a rapid sense-and-respond feedback loop, we can’t learn what we need to do and certainly can’t learn fast enough to matter, to ultimately drive the right changes. What about the other components (leadership, strategy, tech?) The other pieces can literally be borne out of the proof points of real-world validation. Nothing succeeds like successful action, in other words. The good news is that change is in the air in general. New ways of working are finding success. For example, organizations have widely (25% of all orgs by some estimates) begun using cross-silo collaboration, such as devops, to break down the long-standing sclerosis that has built up through the accumulation of technology in the proverbial Legacy Mountain. Trends like this poise change agents to have their voice heard and have impact like never before. Who Should Drive Digital (or Any) Change? What Makes Them Change Agents? The short answer is those who can. In a wide-ranging discussion I had recently with Gloria Lombardi, I noted that one of the biggest lessons of my career was not to try to change people who don’t want to be changed. Instead, find those that do and then empower them. Can identify or develop valuable new ideas. Change agents don’t necessarily need to have ideas about change, they just need to recognize good ones. Has social capital to spread ideas. Change agents have some resources to take their ideas and convince others to join in to help realize them, especially as well-known CIO and industry colleague David Chou added to the discussion, to navigate the political waters..
Can communicate effectively. Having social capital is not enough however, one must also be a good communicator in order navigate the obstacles of change and ultimately gain buy-in, high low, for positive outcomes with the proposed changes. Has ability to realize/drive org change. While change champions advocate for change, change agents actually are able to realize it through their actions and leadership. 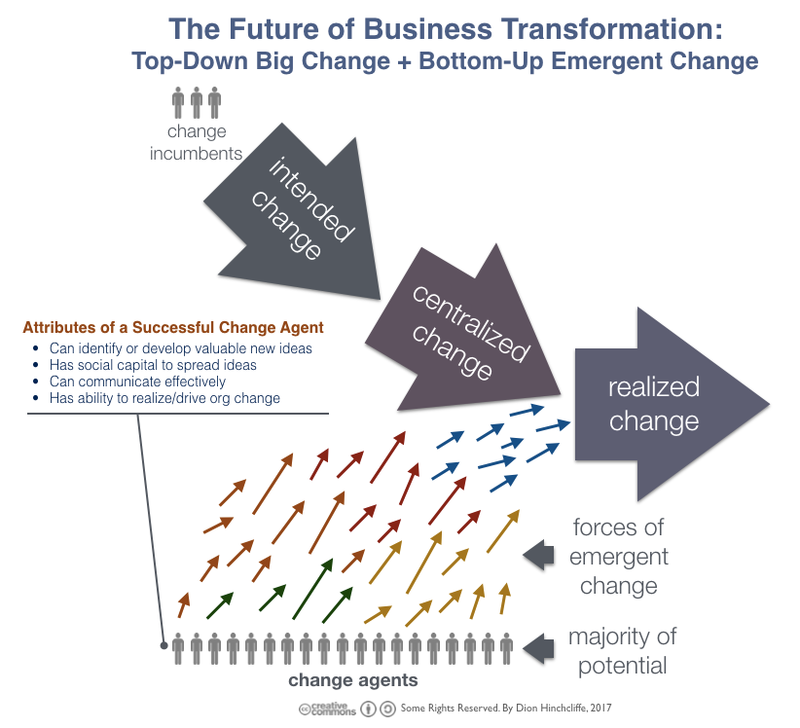 Ultimately, in any organization, the only change happens through change agents, formal and informal, somewhere. Let’s learn how to cultivate them and enable them to help us create our digital future, at scale. Pingback: Who should lead your digital transformation efforts? The first major exploration of why and how to transform the enterprise in the social business era. Now available from John Wiley & Sons. Enter your email address to subscribe to my latest insights. You'll receive notifications of new posts by email.